-No practice today as the Steelers travel to New York to play the Giants tomorrow night. -Here’s Mike Tomlin’s first press conference of 2014. Not a whole lot of new information but is that any surprise? 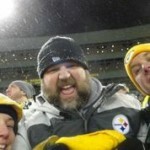 Steelers.com’s Bob Labriola provides comments as well int he adjoining article. -With Adam Podlesh missing all of training camp to this point (wife is expecting), Brad Wing will handle the punting duties. He is the underdog and needs to show his skills immediately. -There was no hitting in practice yesterday. Typical for a final practice before a game. -By the way, I found that several fans were also fans of Johnsonville’s Bacon Cheddar Bratwurst. I tweeted out that’s what I was having for dinner. I highly recommend as did they. -I’m sure many of our readers will ‘politely’ disagree with Rob Rossi’s piece on Steelers’ GM Kevin Colbert. -Big man Daniel McCullers continues to impress. He’s proven he can get to running backs and yesterday knocked down a Landry Jones’ pass. -Maurkice Pouncey could be charged with misdemeanor assault as early as today. -If you haven’t heard our first podcast of the 2014 season you can listen right here. I know that the 1st pre season game doesn’t come with a loot of hoop la but I ask you the fans this question: What do you want to see from the Steelers in the this 1st game? Be honest and don’t shy away from what you feel. If you don’t pre season game then say it, I won’t get mad or even ticked off at you for saying it. Just be honest. I’ll be putting out a piece on the three big things I’m looking for in tomorrow’s game later this evening. I love the preseason games. I enjoy watching the young guys fight for roster spots.